On September 14 Sweden will hold its national and municipal elections. What is most remarkable about these elections – from my perspective – is the increasing popularity of Sweden’s right-wing, nationalist party (the Swedish Democrats) that only gained parliamentary standing in the 2010 elections (with 5.7% of the vote) and the unprecedented attention paid to questions of Sami and reindeer herding rights. In a recent interview on national radio with the Swedish Democrat’s leader, Jimmie Åkesson, the reporter asked for the party’s position on Sami land use rights and Sweden’s intention to continue mining in the north (the historic lands of the Sami people). Åkesson’s response was typical for his party: “by Sami I suppose you mean reindeer herders, the 10% of Sami who engage in herding on nearly one third of the country’s land. Mining is important to Sweden, and if it has to take account of reindeer herding it will be hindered. A balance has to be found, and the national interest must take priority.” Åkesson then dismissed the reporter’s question regarding the UN Declaration on the Rights of Indigenous Peoples. At this moment, most of Sweden’s leading political parties (including right-wing, center/moderate, and socialist) are strongly promoting the mining of iron in the north to largely foreign companies, but not without debate. Much of this discussion has been occurring in Jokkmokk, the rural town where I have been conducting ethnographic research for the past year. Jokkmokk is unique in northern Sweden. It is in one of the few regions that has no mining industry, has a strong reindeer herding industry, and has a UNESCO World Heritage Site, Laponia, within its borders. Where does food come in to a discussion of mining? Sweden’s leading political parties have simultaneously been building the national Matlandet program (the Culinary Nation) that is intended to revitalize Sweden’s rural regions by building artisanal and local food production. In 2014 Jokkmokk was selected as Sweden’s Matlandethuvudstad, or Culinary Capital, partly in recognition of the Sami culinary and reindeer heritage that is so strong in the region as well as the wild products that come from its mountains and forests. Jokkmokk’s inhabitants live between the tensions of these two national programs: mining town or food town. Government representatives from both the food and mining sectors have visited the town during the past year, each there to promote or explain their programs. In interviews, food producers expressed positive and negative views to mining, acknowledging that more customers and more money help any business at the same time that Jokkmokk’s nature-based image and the land base for wild food production are destroyed. They are also unsure that food production or mining alone are the solution to revitalizing rural areas. Interesting forms of protest occur within this tension. For example, Slow Food Sapmi released a beautiful and informative cookbook this spring Smak på Sapmi (Taste of Sapmi) involving many individuals from the Jokkmokk area. On the same day of the cookbook release, the below image of a Swedish open pit mine began to circulate via Facebook. 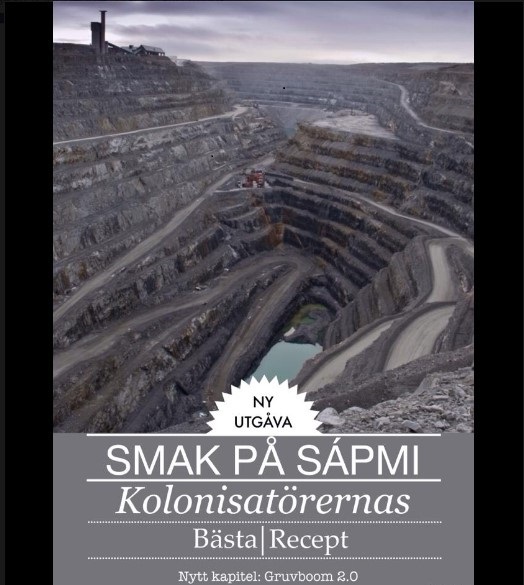 Overlaid on the image is the text: Taste of Sapmi: The Colonizer’s Best Recipes, New Chapter, Mining Boom 2.0. The context raises questions about national policies, the role of food in rural development and imagination, not to mention questions of indigenous rights and recognition. For anyone headed to Slow Food’s biannual Terra Madre this year, check out the Slow Food Sápmi booth and cookbook (send me your impressions!). Until then, I will be writing and awaiting the results of this election. Thus far, polls indicate increasing support (10%) for the Swedish Democrats, and yet quite interestingly, support for Sami cuisines also continues to grow.